Swiss-patented microfiltration provides an excellent taste and a beautifully clear brew. 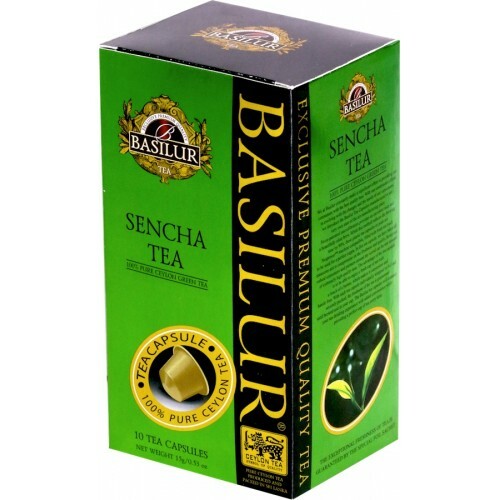 Reducing the brewing time by 90-Percent, Basilur Tea capsules are Nespresso machine compatible. So now you are able to enjoy a fresh cup of tea with a touch of a button, convenient and hassle-free. Sencha Green Tea is characterized by its mellow, pleasant flavour and rich yellow colour, achieved by gently steaming the leaves immediately after picking. The handpicked tea leaves have been carefully processed and packed into these capsules securing its antioxidant properties & high quality.